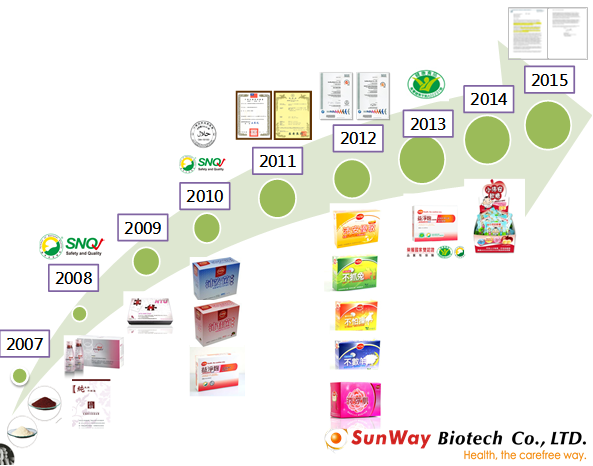 SunWay Biotech Co., LTD. was established and its facility was qualified for GMP certification. The research and technology of Monascus purpureus NTU 568 (red yeast) and Lactobacillus paracasei subsp. 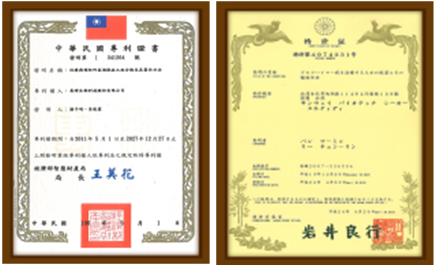 paracasei NTU 101 (probiotics) were exclusively authorized by National Taiwan University. 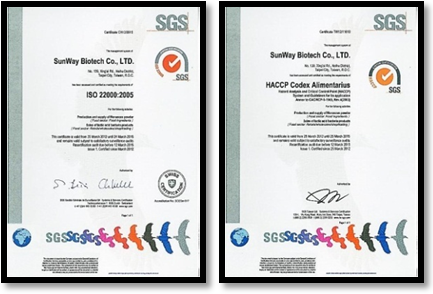 Red yeast (Monascus purpureus) beverages were awarded the Certification of Symbol of National Quality (SNQ). Developing red yeast products in capsule. 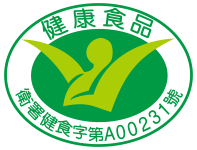 Probiotic products were awarded the Certification of Symbol of National Quality (SNQ). 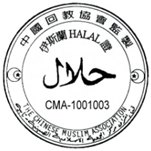 Red yeast capsulate products were granted the Certification of Halal and the US federal trademark “HCW”. The fermented manufacturing processes of red yeast-related products were granted patents and certificates from multiple nations. The main facility was expanded and certified with ISO 22000 and HACCP. Application and development of non-active Lactobacillus, collagen powder, and herbal tablets. 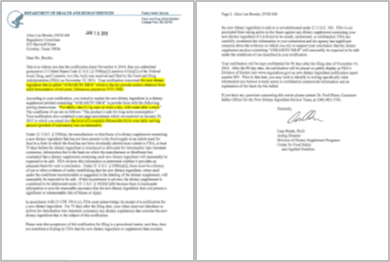 A red yeast product (ANKASCIN 568) was granted the Health Food Permit (No. A00231). Development of Lactobacillus soft sweets. Red yeast and Lactobacillus ingredient supply and contract manufacturing of private label finished products.